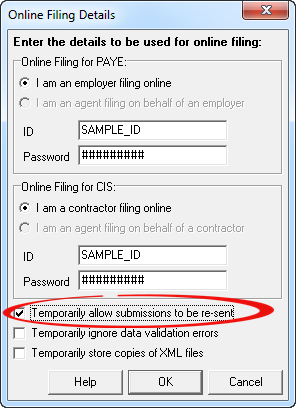 Make the relevant changes on the ‘CIS – Payment Details’ screen. If the payment period is locked then first unlock it by pressing ‘CTRL-U’ on the keyboard or click the ‘padlock’ symbol on the toolbar. Select the ‘File Copy’ layout from the drop-down selector at the top of the report and check the figures if you wish. (Note: the layout of the report has no effect on the actual data submitted to HMRC – the ‘file copy’ layout is simply easier to read on screen). 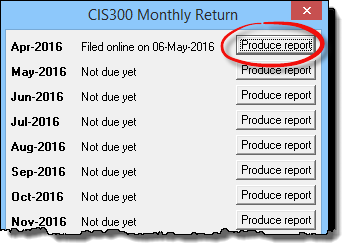 Click on text at the top of the report marked ‘A Monthly Return CIS00 for (date) was filed on (date) – click here to re-submit’. Your amended CIS 300 will be submitted to HMRC in the usual way. When correcting errors Payroll Manager sends a complete replacement CIS 300 report, as per HMRC requirements i.e. it is not just the corrections that are sent, but the complete payment details of all CIS subcontractors that are being paid in that period. A contractor submits a return which includes 10 subcontractor records. The contractor then realises that 1 of those records contained an incorrect value in a monetary field (say direct cost of materials). The contractor should amend the incorrect value and then send a further return to HMRC. In this case this must contain the 9 correct records from the original return plus the 1 amended/updated record. So the amendment would include 10 records in total. YOU MUST NOT SEND THE 1 CORRECTED RECORD ON ITS OWN AS THIS WILL REPLACE ALL 10 RECORDS SUBMITTED ORIGINALLY AS IT IS TREATED AS A REPLACEMENT, NOT AN ADDITION. A contractor submits a return which includes 10 subcontractor records. The contractor then realises he has omitted a further subcontractor record in error. The contractor needs to submit a further monthly return to HMRC. In this case it must contain the 10 records included in the original submission, plus the one that was omitted. So the amendment would include 11 records in total. YOU MUST NOT SEND THE 1 ADDITIONAL RECORD ON ITS OWN AS THIS WILL REPLACE ALL 10 RECORDS SUBMITTED ORIGINALLY AS IT IS TREATED AS A REPLACEMENT, NOT AN ADDITION. A contractor submits a return which includes 10 subcontractor records. The contractor then realises he has included a subcontractor record in error. The contractor needs to submit a further monthly return to HMRC. In this case it must only contain the 9 records that were correctly included in the original submission. The record submitted incorrectly originally would simply be excluded from the amendment. So the amendment would include 9 records in total.